This is a review of the Baofeng UV-5R dual band 2 metre/70 Centimetre hand-held transceiver. I suppose I should start by saying what motivated me to buy one, well it was simply the price. Most dual band Hand-Helds are in the 100 pound plus range and the cheaper Woxoun around 85 pounds or so, and this new Baofeng was only 32 pounds here in Germany including postage and if ordered directly from China I have seen it as cheap as 28 pounds almost a third of the price of the nearest competitor. And although I’m not a VI operator myself I felt that this Hand-Held might be suitable for someone with a visual impairment as it does have some voice announcement features and so I will try to test this by operating the radio with my eyes closed in the hope of getting some idea of whether it really would be suitable or not. I didn’t expect much for 30 odd pounds especially these days where a simple desk mike often costs a hundred pounds or more and so when it arrived I was pleasantly surprised. It came in a small square carton and on opening it I was presented with a very neat hand-held which didn’t look in the least bit cheap and certainly seemed externally to be up to the build standard of my other more expensive radios. The box contained the Handy plus a 1800maH Li-ion Battery pack, a belt clip, a wrist strap and an extra earpiece for silent listening and a drop in battery charger, this is nice as you can drop the whole Handy into it for charging and don’t have to remove the battery pack or use a fiddly cable to connect the charger. There was also a rather basic instruction book to round off the contents. The main case of the handy is black (though other colours are available) and on the top you find the socket for the rubber duck antenna and a volume control which includes the on/off switch and a white bright emitter LED which allows the Handy to be used as a torch and which in practice is surprisingly bright. The antenna socket is a reverse SMA (male) type and so if you want to connect another antenna perhaps with a BNC connector then you will need an adapter, though these are readily available for a few pounds on Ebay. The front is divided into 3 areas and at the top is an LCD Display and below that is the speaker and to the left of the speaker are two important buttons which I’ll discuss in a minute and a small green LED which lights when a signal is being received. In the bottom third are the 4 rows of 4 buttons for menu functions and entering numeric information. All of the buttons are quite a good size and raised above the surface of the Handy and have a very positive click when pressed, so that once I had familiarised myself with the layout I found no problem locating the ones I wanted and operating them even with my eyes closed. On the right hand side is a flip open cover which reveals two sockets, a 3.5mm and a 2.5mm stereo socket into which you can plug the accessory earpiece or a combined microphone/speaker. These two sockets are also used for the programming cable to connect the Hand-held to a PC for programming. The Li-ion battery clicks firmly into the back of the transceiver and the belt clip is attached by two screws if it is required.. Rotating the volume control turns it on with a click and a voice announces `Frequency Mode’ and the LCD display lights up in Violet with a welcome message for a couple of seconds. The unit has two basic modes of operation `Frequency Mode’ where two VFO frequencies are displayed on the screen and you can switch between them with a small blue A/B button. Or `Channel Mode’ which uses the 128 memory channels and is selected by a quick press of the orange coloured VFO/MR button. Both the VFO/MR button and the A/B button are placed well away from the other buttons being in the middle section of the Hand-held to the left of the Speaker. On the left side of the radio are three buttons , at the top an orange button which when pressed selects the FM radio for listening to stations in the 76 to 108Mhz broadcast band or it can be switched to the 65-75Mhz band by a quick press of the band button (to the right and just below the speaker). Pressing the orange button a second time turns the FM radio off. In the middle is a larger `PTT’ button and below that a `Moni’ button which is pressed once turns on the LED torchlight, if pressed a second time the LED blinks as an alarm and if you hold it pressed the squelch is switched off, the LCD display turns blue and you hear the usual loud hiss of an un-squelched VHF FM Receiver. In `Frequency Mode’ I typed in 145500 on the keypad and each key was announced as I pressed it as `one’, `four’,’five’ etc. I was then listening on 145.500Mhz. I pressed the PTT button and the display turned orange and I had a quick contact with a local amateur. Using the standard 4 Watts, though low power 1 Watt is also available. He said it sounded fine though the modulation sounded a little quiet. This seems to be one of the only weaknesses of the Baofeng, you do need to speak very closely to the microphone, it’s said this deliberate as when the Baofeng is used in a commercial environment (for which is was first designed) then they didn’t want a lot of background noise being transmitted if the environment was noisy. I then punched in a 70cm frequency and repeated the test with no problems at all. Later I tested it on 2M and 70cm Repeaters and it worked fine on both bands. If while transmitting you press the band button then it transmits a 1750Hz tone to open a repeater. Though you can also program CTCSS or DCS tones which are required by a lot of repeaters these days. And there we come to a bit of fly in the ointment for all users and especially if you are a VI user. Programming the Baofeng from the keypad is possible but not particularly easy. There are several videos on `You-Tube’ on how to do it but not really practical for a VI user. Whether you are visually impaired or not, obtaining the programming cable and free software from Baofeng is a must. This makes programming the 128 Memory channels and setting other features a breeze. Here in Germany I paid around 8 pounds for the programming cable but these seem a little more expensive in the UK. Though they won’t break the bank. I had no problem programming the Baofeng with the standard software and cable. I could do it on both my Windows 7 Professional and Windows XP Professional computers perfectly. Even though the seller had said in his advert that the cable was only for XP. That said there have been a number of items on the internet saying that people had problems with Windows 7. This seems to be down to the version of the Prolific USB driver that windows 7 loads when you plug in the cable. However I have the latest version on my Windows 7 machine and it worked perfectly, this may not be the case with some versions of the driver and you may need to install a compatible version. The free software from Baofeng works pretty well but it’s not particularly sophisticated. There seem to be a number of different versions of the software and a number of versions of the firmware in the Handy. The older models have Firmware BFB28x, the newer BFB29x and there seem to be some differences. On the website I found a version of the programming software with NEW_OLD in the name which I suspect works with all versions but has a couple of unfortunate features. When it starts there are lots of question marks on the screen because it starts in `Chinese’ and you have to go to top menu bar and select the second item from the right to switch to English. Then everything magically appears in English. The only other minor problem with this software version is that in the menu bar it doesn’t have the `OTHER’ option which allows you to change the welcome message on the Handy to for example `Your Call-sign’. I think this is missing because this feature is only available on devices with the newer BFB29x firmware. As mine has the newer firmware I used another version of the software from June of this year with the name UV_5R_VIP which does have the `OTHER’ option in the menu and allowed me to change the Welcome message to `DJ0HF’. The radio is pre-loaded with a lot of channels and you can select `Read from Radio’ to download them into the program and then delete or modify them as you wish. The only unusual feature is that you don’t enter a repeater offset but instead enter not only the receive frequency but also the transmit. So for example as receive you might enter 145.600Mhz and the program automatically displays the transmit frequency as 145.600 as well and you have to change it to 145.000 to get the 600Khz offset. Unusual but not a big problem. Once you have entered all of the simplex and repeater channels you want then you simply click on `Write to Radio’ to upload the data and that’s it. As I said the Software isn’t very sophisticated and so after it tells you it has finished reading or writing the data you actually have to click `Cancel’ to get back to the main screen rather than it going back to the main screen automatically. Sometimes I noticed that the first time I said Read or Write it gave and error but after clicking it away then the second attempt always worked without problem for me. Very important is to know on which `COMM’ port the Prolific USB cable has been configured. It usually ends up on COMM3 but this many not be true, depending on how many COMM ports your computer already has. Some versions of the software automatically see the correct port and select it others you have to choose the `Communication’ option in the menu and click the required COMM port. If you have the wrong port selected then nothing will happen and you will not be able to read or write anything over the cable to the radio. There is another software package called `CHIRP’ which can be used to program many different types of radio but it warns that it is experimental with the Baofeng, so I tried it in read mode and it read the data from the radio without any problem but I didn’t try writing anything back to the radio in case I `Bricked’ the radio and made it useless. Anyway I find the Baofeng software easy to use and so don’t have any real reason to use CHIRP. So if you are a VI user could you use the radio. Well assuming you can get someone to help with the programming of the channels or have a very good screen reader which will work with the software, then I think yes. In `Frequency Mode’ (which is announced) you only have to punch the frequency and all of the keys will be announced and that’s it. You can work simplex on the channel you punched in very easily. Pressing the VFO/Memory button will announce `Channel Mode’ and each time you press the UP or Down arrow the channel will step up or down one memory channel and the new channel number is announced. So as long as you remember your favourite simplex or local repeater channel numbers then there shouldn’t be any great difficulty in finding the channel you want and using the radio. This review is already getting very long so I don’t want to go into all of the menu items here in detail (there are 40 of them). You can program any of the facilities from the software or by pressing the `Menu’ button and then a two digit menu number. Pressing `Menu’ again allows you to change the value of the item and in some cases announces the name of the menu item selected. After setting the required value pressing `Menu’ again, announces `Confirmed’ and pressing `Exit’ takes you out of the menus. If you are in `Channel Mode’ then pressing and holding the scan button, starts the radio scanning through all of the memory channels and the start of the scan is announced so if you are a VI user you know the scan has started. You can stop the scan by simply hitting the `Exit’ button. In the menu’s it’s possible to select to stay on the active channel until the carrier drops and then continue scanning, to stay on the active channel for a few seconds and then if `Exit’ isn’t pressed continue scanning or to exit scanning mode completely once an active channel has been found and remain on that channel. As I say there are so many menu options that I can’t list them all here but for example you can set the squelch level (though I have never had to alter it). Select different colours for the display for Receive, Transmit etc. Set the step size, for example 12.5Khz or 25Khz etc. Turn on VOX operation if you don’t want to use the PTT. Set dual channel watch which allows two VFO frequencies to be monitored, the radio skipping back and forth between them until one of them becomes active. Or you can do the same with 2 Memory channels. Interesting is that if you are listening to FM Broadcast radio and one of the channels becomes active then the broadcast is muted until the activity on the channel ends and then it switches the broadcast receiver back on again. You can of course set CTCSS tones and interestingly you can set them for both transmit and receive. Normally for a repeater you would only set transmit CTCSS so that when you transmit it includes the tone but on receive you don’t need it. But if you set it for receive too then if you are talking from one baofeng to another in simplex or with a group of radio’s the receiver will only open if it hears the CTCSS tone from the other baofeng and ignore any other transmissions on the frequency. You can program a roger beep and lock the keyboard and lots of other things but I think you get the idea. So is it an all singing all dancing Handy for the VI user, well most certainly not. But could a VI user operate the normal day to day functions of the radio in simplex or on a repeater (once the channels have been set up) I think the answer would be a most definite `yes’. 1 The frequency will not be read on demand. The frequency numbers are only spoken when entered. 2 The firmware appears to be very similar to the Wouxun KG-UVD1P, but the menu numbering is slightly different. I’m sorry to say that although the menu’s are very, very similar they do not have the same numbers. So for example on the Wouxon, you press ‘Function’ (which is Menu on the Baofeng) then 4 to go to the power Menu, on the Baofeng it’s Menu then ‘2’ then when you press ‘Menu’ again, like the Wouxon it announces ‘Power’ and you can use either the up or down buttons to cycle between high and low power. Like the Wouxon you can also use the one and zero buttons to set the power but unlike the Wouxon the one sets low power and the zero high power. I have recorded chapter 12 of the manual, describing the menu numbering. It is in the Related Downloads section below. 3 I tried to see if I could insert the Handy into the charger without it fully contacting the charger tabs but I really couldn’t. If I hadn’t inserted it properly I could twist the Handy clockwise and anticlockwise, if I had it fully inserted I couldn’t twist it. 4 The Wouxon review said that the Wouxon only gave about 2 seconds to enter a change after selecting a menu item before exiting the menu and returning to the normal mode. My Baofeng gives you about 8 seconds before it does this. 5 Unlike the Wouxon there is no rotary control on the top for changing frequency/memory channel or menu item. There are just the up and down keys and the numeric keyboard. 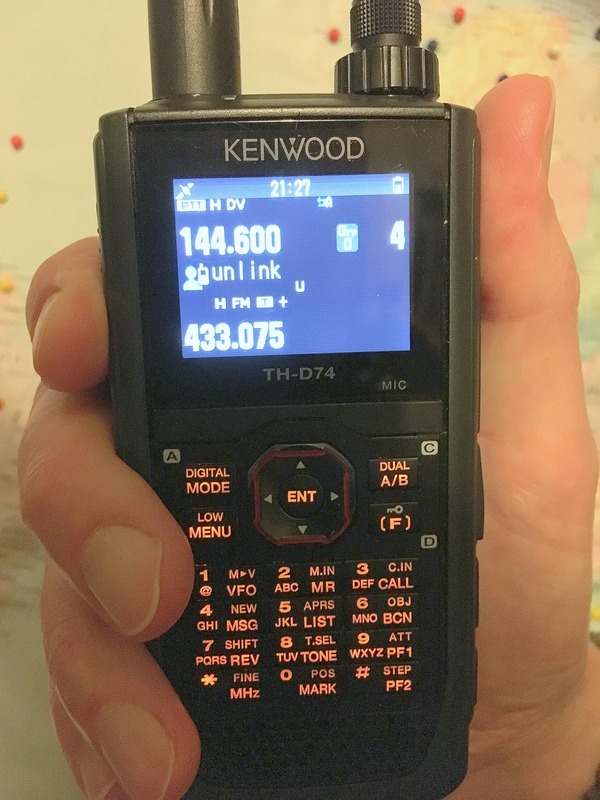 The introduction of the Wouxun dual band 2M and 70cm handhelds has caused quite a stir in amateur circles. It has been favourably reviewed in RadCom and Practical Wireless, and a comprehensive set of features aligned with a price tag of under £90, make it very attractive. Of particular interest to blind users, is the inclusion of voice prompts as a standard component. I was asked to review the handheld in August 2010, but due to high demand we had some trouble sourcing one. The radio I reviewed came from Moonraker. Initial observations on opening the box, were of a well made, good quality handheld. I had some help attaching the belt clip and the wrist strap, but the battery pack fitted intuitively and clipped snugly into the body. The radio needed an initial over night charge, and here I ran into a problem. Whilst the radio has a nice ‘intelligent’ charging stand, it is possible to push the radio very firmly into the stand, but actually miss the contact points. There is no obvious way for a blind person to know if it is charging or not. A sighted person can see the LED on the stand, but there is no other indication, until you grab it the next morning, and find it has not charged. I’m not alone in noticing this problem, as at least one other member has encountered the same issue. I’ve found two methods of making sure I am charging the Wouxun, and I think it might help others by mentioning them here. Firstly, the LED on the charging stand can be monitored using an audio Light-probe. These are readily available from RNIB. The second method is a trick I use to make sure my electric shaver is pushed securely into its charging stand. I use an old transistor radio, tuned to a clear Long-wave frequency, and listen for interference when contact is made. Using this method meant I could adjust the Wouxun, until I could ‘hear’ it was charging. My experience of using VHF and UHF is limited, and I had never independently used a handheld before. My initial thoughts were that the Wouxun was very tactile and well laid out with good sized buttons. The radio spoke when I turned it on, and the numbers were read back as I entered a frequency, all good so far. I was very pleased to find the radio always returned to a known position when switched on. If you get ‘lost’, simply turn off and on, and you are back in VHF mode. At this early stage, I discovered the most obvious limitation of the radio when being used by a blind person. It is its inability for the voice to read the frequency on the display. This is not necessarily a huge problem if you are using repeaters or you are going directly to a simplex frequency, but if you are using the rotary tuning knob, and you find a busy frequency, the radio cannot tell you where you have landed. Apart from the seemingly obvious omission of a frequency voiced readout, I initially struggled to grasp the concept of programming the Wouxun. A sighted user will almost certainly cycle through the menu system with the rotary tuning knob, and then choose an option with the arrow keys. There appeared to be a way of using menu numbers to access these directly, but I found there was no time to think about what I was doing, before the radio automatically left the menu and returned to its operating state. Fortunately, Quentin GW3BV, our Chairman, came to the rescue when we were at Newark. He found a superb document for using the Wouxun ‘eyes free’, written by Buddy Brannan, KB5ELV I. It describes the layout of the Wouxun , and most importantly describes how the radio can be successfully programmed. I recommend this guide as essential for any blind user. A good example of using the menu system by numbers, is to change the radio’s power. The Function key is pressed, followed by ‘4’, Function again, and then instead of using the arrow keys, ‘0’ can be pressed for low and ‘1’ for high power. The final step is to press Function again. In this example, menu ‘4’ accesses the Power menu, 0 or 1 select either low or high. This is where the radio’s voice prompts really shine. Turn on the Wouxun and it will say ‘Channel Mode’ or ‘Frequency Mode’. To change a menu setting, we switch to ‘Frequency Mode’. 1 Press Function – FUNCTION SELECT, is spoken. 2. Press ‘4’ – BEEP. 3. Press Function – POWER SELECT, is spoken. 4. Press ‘1’ – BEEP. 5. Press Function – ENTER, is spoken. Not all menu options are spoken as with the ‘Power’, but programming is fairly straightforward, if you can remember the menu numbers. I say ‘fairly’ straightforward, because this leads me to another limitation of the Wouxun, that could be improved for all users. I’ve previously mentioned, the radio returns to its standard operating state, if you are not quick enough when changing a menu setting. I estimate the time is set at about 2 seconds. I found this to be hugely frustrating for one of our senior members, when I was explaining how to use the menu. I found I barely had time to give the next command before we heard the quiet ‘triple beep’, indicating we would have to start again. In my opinion, the menu time-out should be listed as an adjustable menu option itself. 2 Seconds is not long enough! One of the main uses for a VHF or UHF handheld will be to access local repeaters when on the move. With this in mind I was very impressed with the voice prompts giving positive confirmation between Frequency Mode and Channel Mode. Frequency Mode is where you enter simplex frequencies and adjust the settings, and Channel Mode allows you to cycle through previously assigned memory channels. When switched on, the Wouxun will tell you which mode is being used, recalling the position the radio was in when you switched off. When in ‘Channel Mode’, the rotary tuning control will cause each channel number to be spoken, as it is turned. Unfortunately, the actual frequency in the memory channel is not voiced, only the channel number. Entering a repeater into a memory channel is fairly straightforward with just voice and audio prompts. Again, the main problems will be the short time allowed for each keystroke, and the need to remember menu numbers. I found the easiest way of adding a repeater to a memory channel, was to firstly set the CTCSS frequency whilst still in simplex mode. In my case this was menu ‘16’ and then option ‘11’, giving a transmit CTCSS of 94.8. I did not need to use repeater offsets, as I used a menu setting that allowed both input and output frequencies to be stored. Menu ‘27’ firstly stores the repeater receive frequency into a memory channel, and then using menu ’27 again allows the transmit frequency to be stored into the same memory channel. 1. Press Function – FUNCTION SELECT, is spoken. 2. Press ‘1’ ‘6’ – BEEP BEEP. 3. Press Function – CTCSS, is spoken. 4. Press ‘1’ ‘1’ – BEEP BEEP. 5. Press Function – ENTER, is spoken. 1. Enter the receive frequency – each number is spoken. 2. Press Function – FUNCTION SELECT, is spoken. 3. Press ‘2’ ‘7’ – BEEP BEEP. 4. Press Function – CHANNELL MEMORY, is spoken. 5. Press ‘0’ ‘0’ ‘1’ for channel 1 – BEEP BEEP BEEP. 6. Press Function – RECEIVING MEMORY, is spoken. To set the ’input’, go through the same steps again, but this time enter the transmit frequency before you use menu 27. When ‘0’ ‘0’ ‘1’ is entered, for the channel number, TRANSMITTING MEMORY, is spoken. The repeater settings are now stored in memory channel 1. The final step is to remove the CTCSS setting, as you are still in simplex mode. Select menu ‘16’ again, and choose option ‘0’ to turn off CTCSS. With experience, I found I used simplex mode on either VHF or UHF quite happily. I found repeaters could be set up, and I could easily move through the memory channels, although I had to remember the contents of each memory channel. The final step was to review the PC interface software for use with a screen reader. Again, Quentin found the software on the Wouxun Web site, and ordered a USB cable. Installation and set up was straightforward, and I started by ‘reading’ the settings in the Wouxun Back to the PC. The interface is simple, and shows each memory channel in a spreadsheet like table. I found that once a receive frequency had been added to the first column of the table, I could then tab to each subsequent column. Using a screen reader, in my case Window-eyes, I was able to read the column titles and then work out which area I was tabbing into. I could enter the transmit frequency, the ctcss tone, the power level, and whether wide or narrow FM was to be used. Using this method it is relatively easy to enter all of your local repeaters into memory channels. Once entered, these can be ‘written’ back to the radio. In summary, my experience with the Wouxun was favourable. It is not perfect for a blind user, but with reference to an external menu list, and some dexterity in entering the settings, it can be satisfactorily used independently. If it is to be programmed with many memory channels, the Wouxun software and USB cable would be a very useful addition.